On Sunday, Hillary Clinton publicly declared her candidacy for the United States's 2016 presidential race with a message delivered through a video clip. In the video, she said, according to reports, that America is always in need of a champion, and that she is ready to be that champion. She said further that she wants to fight for the middle class, just like all Democratic candidates are known to say. Hillary has not explained in her agenda, whether the abject poor are worthy being fought for or not. Leaving the abject poor out of her message is one challenge Hillary and her supporters may not have noticed as capable of being noticed by the generality of the public. 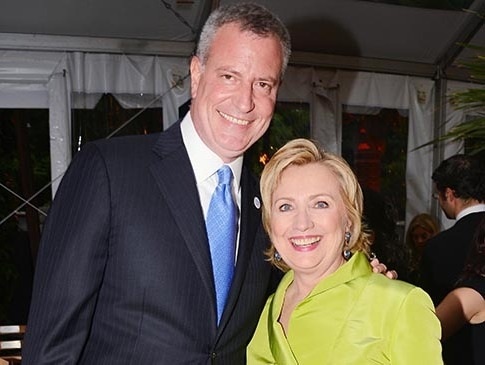 But the real challenge to Hillary surfaced in the words of New York's Mayor Bill De Blasio, who said that he is not ready to endorse Hillary yet, until he has watched her and convinced of her liberal credentials. De Blasio's words were published by one of the two major papers distributed free in New York City. Apparently, some among Hillary's supporters did not take kindly to Blasio's words. And they blasted him with words in their tweets like he was trying to put himself above others in the rank of the liberals. They apparently had expected de Blasio to give Hillary an approval without conditions. But the real question is whether Blasio is a political challenge to Hillary with a candidate he may want to support against Hillary, since as a mayor he still about to complete a term in office and cannot be expected to run for another office like people wish him to runner the presidency, because they say he has a family composition that will make him a compelling candidate. If not, with Hillary choosing Bladio's Brooklyn neighborhood as her campaign's base, one would have thought it is a deliberate act to keep Blasio from running. Hillary's choice of Brooklyn as her campaign's base is what observers have termed as showing what politicians are capable of doing to corner to win support. Of course, they say the black population support matters, just like the Latino and the Caucasians' support. With Mark Rubio, a Latino, entering the race from the Republican Party, curious political observers say it poses a challenge to Hillary's support among Latino voters. Therefore, the need to ensure another strong bloc is secured by moving the campaign base to a place regarded as an African-American city in New York cannot be disregarded or overlooked. However, an interview with a Latino voter shows that whoever emerges the Democratic nominee in the primaries can still count on Latino votes. The Latino voter, Sanchez Sarit, said he is a Democrat and would not vote for any candidate because he the candidate is Latino if the candidate is not a a Democrat. Sanchez asks what political party Rubio belongs. When he hears Rubio is a Republican, he says he can never vote for a Republican, and begins to talk about how the Democratic Party has reduced the unemployment rate. He asks whether the reporter isn't aware of the current low rate of unemployment. But some people contend that Sarit's position does not mean Rubio has no capability of cutting into Democratic Party's Latino base. They say Rubio is Latino. They say Rubio looks presidential. They say further that Rubio is young, and that if Rubio emerges the Republican Party's nominee, whoever emerges the Democratic's nominee should be ready for a mass loss of Latino votes. They say there would be nothing wrong for Latinos voting to have one of their own in the White House, just like African-Americans ensured Barack Obama emerged president with almost hundred percent African-American votes for him. It is obvious that Hillary's handlers seem to have studied the field. They seem to have seen either Rubio of Jeb Bush's likely strong Latino base, and that whoever emerges the Republican Party nominee between them is capable of dwindling the Democratic Party's Latino support. Whatever the outcome of her running, Hillary would be remembered for her tenacity and determination to be president. At 69, she reminds observers of Nigeria's Muhammed Buhari who has just won a the presidential race at 72, after four election.